WILDWOOD CREST – Bargain hunters are encouraged to spend the day in Wildwood Crest for the 17th annual Borough-Wide Yard Sale on Saturday, May 4, from 8 a.m. to 4 p.m. In addition, the borough will also offer free access to a paper shredding truck for its residents on Saturday, May 4, from 9 a.m. to noon at the Department of Public Works yard, located at 120 W. Newark Avenue. 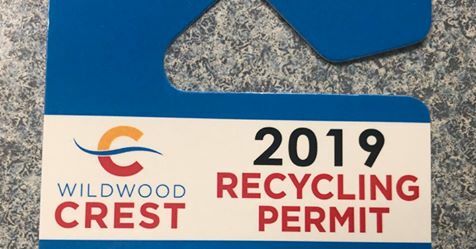 Proof of residency or a Wildwood Crest recycling permit will be required to use the shredder. Maps featuring yard sale locations will be available beginning Friday, May 3, at the following locations: Wildwood Crest Borough Hall, 6101 Pacific Avenue; Crest Pier Recreation Center, 5800 Ocean Avenue; Joseph Von Savage Memorial Pool, 8800 New Jersey Avenue; and The Hardware Store, 105 W. Aster Road. The yard sale location map will also be available online at www.wildwoodcrest.org beginning Thursday, May 2. Rain date for the yard sale is Sunday, May 5. The paper shredder will be available May 4 rain or shine. Residents and visitors are reminded to obey all traffic laws as they travel through town on the day of the event. Those wishing to participate in the yard sale can download applications from the from page of the borough website at wildwoodcrest.org. Deadline to register is Friday, April 26. 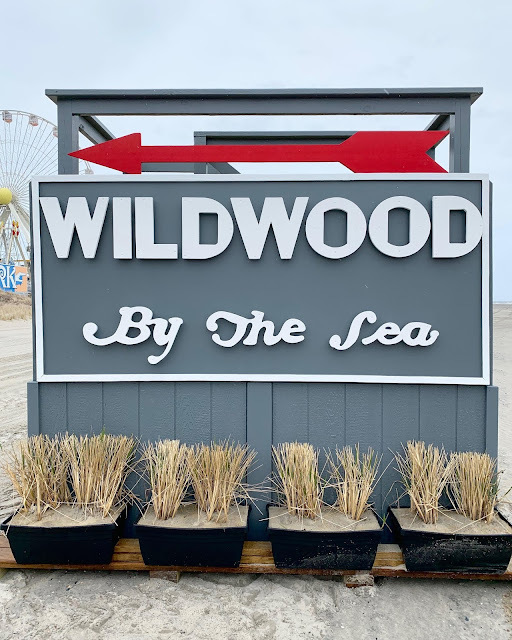 WILDWOOD CREST – The Borough of Wildwood Crest is currently soliciting opinions from its residents on whether the borough should permit the sale of alcohol in the borough. 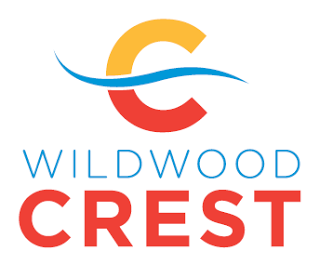 Those who wish to express their thoughts are invited to attend any upcoming meetings of the Wildwood Crest Board of Commissioners, which meets twice per month at Wildwood Crest Borough Hall. A schedule of meetings is available on the borough’s website, www.wildwoodcrest.org. Should a referendum allowing for the sale of alcohol in Wildwood Crest be passed, the borough would be permitted to issue just one plenary retail consumption license (restaurant/bar license) and one plenary retail distribution license (liquor store) based on a New Jersey statute that limits the issuance of liquor licenses by a municipality with respect to its total year-round population. The borough is not required to issue any such license, however. Should a referendum pass, the Wildwood Crest Board of Commissioners may elect to issue the borough’s allowable one consumption license for use in a restaurant and within a designated business zone, which could stimulate additional business growth within that district. The borough can also place restrictions on hours of use of such a license. If such a license is approved, special event permitting could also be considered by the Board of Commissioners on a case-by-case basis for those events that are in accordance with the character of the borough. There is an exception to the population limitation statute for hotels or motels that contain at least 100 sleeping rooms. 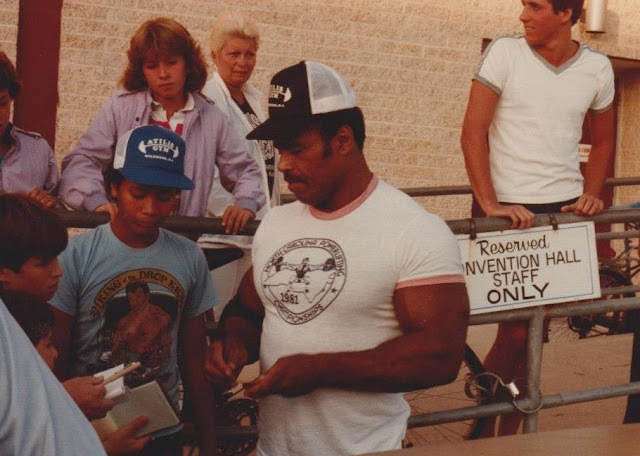 Currently, there are a number of such hotels, motels or condotels in Wildwood Crest. Such hotels and motels would qualify for a consumption license, should the borough decide to issue such licenses upon the passage of a referendum allowing for the sale of alcohol. Any potential issuance of a liquor license would serve as a one-time financial benefit to the borough via the sale – through auction, bid or other process – of said license. Wildwood Crest has been a “dry” town since a referendum prohibiting the sale of alcohol in the borough was passed in November 1940. Prior to that referendum, alcohol sales were permitted in Wildwood Crest, in which, at one time, there were two liquor licenses. The 1940 referendum can only be reversed by another referendum, which could be placed on the ballot for the general election this November. In order for the matter to go to referendum, a petition signed by a minimum of 212 registered voters must be presented to the Board of Commissioners. This petition would have to be organized by a registered voter who cast a ballot in the 2017 general election. Following the submission of such a petition, the governing body must then adopt a resolution requesting the Clerk of Cape May County to include this potential referendum in the next general election. The Borough of Wildwood Crest Police Department and many of the borough’s various volunteer boards – including the Tourism Development Commission, Recreation Commission, Green Team and Wellness Committee – are currently reviewing the issues related to the potential sale of alcohol in the borough. In addition, the borough has already met with several professional planners, all of whom have stated that the addition of one liquor consumption license is vital to a town that prides itself on being a tourism destination, particularly when all of Wildwood Crest’s surrounding communities all permit the sale of alcohol. Residents of Wildwood Crest may also express their thoughts on this issue via email to borough administrator Connie Mahon at cmahon@wildwoodcrest.org, borough clerk Patricia Feketics at pfeketics@wildwodcrest.org or to the borough’s general email address, info@wildwoodcrest.org. 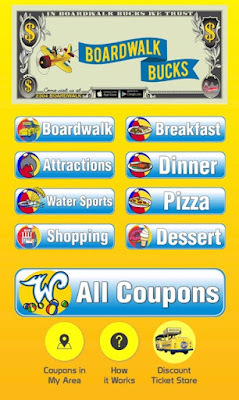 The popular Boardwalk Bucks App has been updated for 2019, and is now available on iPhone (iOS) and Android devices. This year's version features over 100 coupons for businesses all over the Wildwoods (see list below). Be sure to check the app often, as new coupons are added weekly. Visit www.WildwoodDeals.com for additional info, updates and savings. Believe it or not, we are under two weeks away from Opening Day at Morey's Piers! Mariner's Pier will begin welcoming guests at 11 a.m. on Saturday, April 13, kicking off Morey's much-anticipated 50th Anniversary Season. If you're looking to get the jump on your 2019 amusement planning, the pre-sale for Morey's Piers' Annual Spring Sale is underway (the sale itself officially runs April 8 - 26). Gift certificates, Sightseer Tram Car tickets and more are also available. Check out the official Spring Sale page for complete information and to order. Long Live Curley's Fries... No Foolin'! Be honest - Did they get ya? 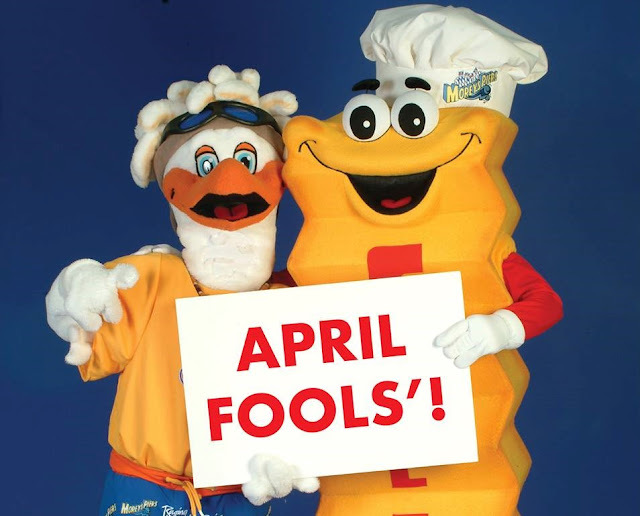 This afternoon, Morey's Piers revealed that it was, in fact, playing a big April Fool's joke with its previous announcement that longtime staple Curley's Fries would be removed in favor of a "greener, healthier" alternative. In a "press release" sent out last night (sneaky, very sneaky), Morey's introduced "Greenery's, a concession stand offering a variety of healthy and convenient food items that guests can eat on the go," also noting that, due to to space and cost constraints, the Curley's locations at Surfside and Mariner's amusement piers were being rebranded to accommodate the new offering. Citing social media demand and industry studies, it was explained that Generation Z consumers "want more organic and natural foods without additives and they are more likely to be vegetarians." The topper was a detailed listing of Greenery's menu options, which included kale chips (brushed with avacado oil and baked with a seasoning blend, no less), roasted chick peas and, our favorite, a locally-sourced seaweed salad. 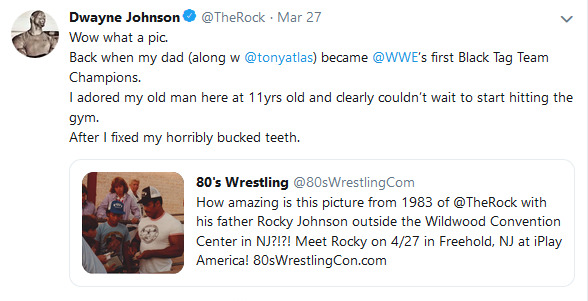 You really have to appreciate the commitment and attention to detail here. The post set off a verifiable firestorm on social media. While many caught on to the joke, the overwhelming majority of responses made it clear that they were... umm, NOT in favor of this idea. "For the last 45 years, Curley's Fries has been treating the taste buds of millions with our signature crinkle fries & we're happy to announce that guest can still indulge in this Wildwood boardwalk tradition starting on April 12 when Curley's Fries opens for the season!" As a bonus, the post stated that the first 50 people in line at Curley's (both pier locations) on Saturday, April 13 will be treated to some FREE fries, in honor of Morey's 50th Anniversary season. As hard as it may be to believe, we are already staring down the last weekend of March. Spring has officially arrived, and though Mother Nature hasn't officially broken up with Winter yet, that relationship is on borrowed time. If you own or run a local biz and would like your date to be included in our bi-weekly update, please drop us a line at wildwood365@gmail.com. The popular FREE Downtown Wildwood Movie Night returns for its second season at Byrne Plaza (Pacific & Oak Avenues) beginning Tuesday, June 25 with a screening of Teen Titans Go! To The Movies. From that point on, movies will be shown at dark (approx. 8:15 pm) every Tuesday night until August 20, with the exception of August 6 (National Night Out). In the case of rain, movies nights will be moved to Wednesdays. A special Halloween event on Friday night, October 25 will feature Hotel Transylvania 2. Moviegoers are encouraged to bring beach chairs or blankets to the plaza. FREE parking will be available in the lot behind the Pacific & Schellenger Avenues property, with entrances on Schellenger and Oak Avenues. For additional information and updates, visit Wildwood By The Sea on Facebook. 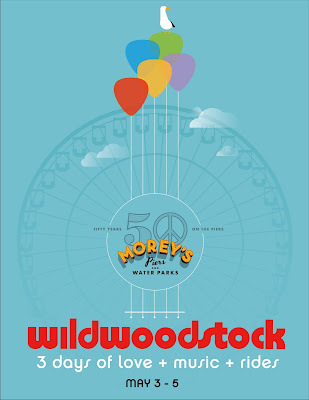 Morey’s Piers, located in the Wildwoods, NJ, kicks-off a season of 50th anniversary celebrations with a new spring festival from Friday, May 3 through Sunday, May 5. Bands will take the Coca-Cola branded stage at Mariner’s Pier near the Giant Wheel starting Friday at 6 pm through Sunday at 4 pm. The full line-up can be found at www.moreyspiers.com/wildwoodstock. Guests can also visit Jumbos’ Grub & Pub for more live music paired with classic boardwalk eats. 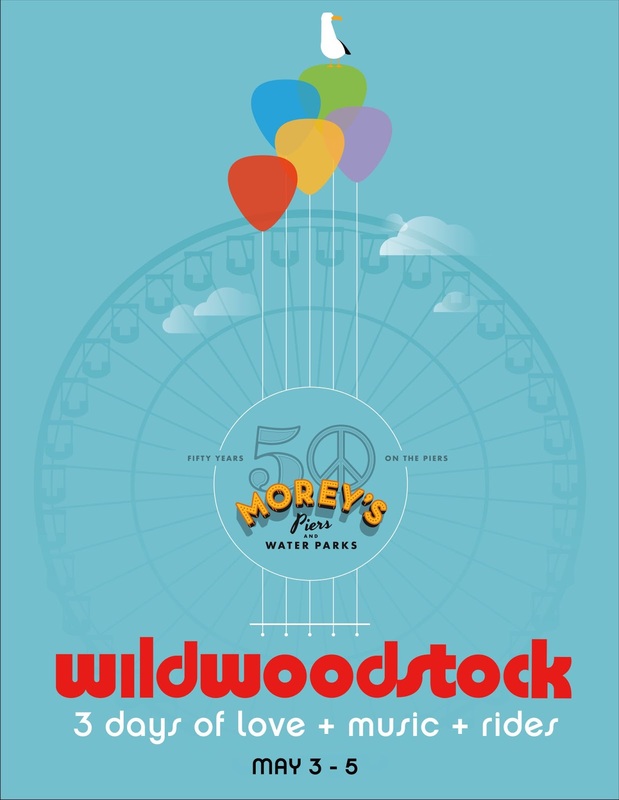 Morey’s Piers is throwing it back to its summer of ’69 roots and is spreading the love with a social media contest for married couples to enter to win a vow renewal ceremony. Jack Morey, second generation partner, will officiate the group ceremony for fifty lucky couples on Saturday, May 4 at 1 pm in front of the iconic Giant Wheel. From March 25 to April 22, married couples of all ages and length of marriage can enter to be one of the fifty winning couples who participate in the group vow renewal ceremony by posting a fun wedding photo using #MoreysWildWedding via Facebook, Instagram or Twitter and tagging @MoreysPiers. Fifty duos will be chosen at random, all fifty couples (100 people) will participate in the vow renewal ceremony with a champagne toast, and each winner will receive ride passes valid for Saturday, May 4 and Sunday, May 5, plus a $50 dining card. Social media fans will then choose the grand prize winner of the #MoreysWildWedding contest by voting on their favorite photos from April 27 through May 3. The grand prize is a two-night stay at a Morey Resort, Breakfast in the Sky for two people (based on availability), a Wildwood helicopter ride for two from East Coast Helicopters, and two ride and water park passes valid for three days. The winners of the grand prize will be announced on Saturday, May 4 right before the vow renewal ceremony. Prize must be redeemed during 2019 season. Visit https://woobox.com/fyn8qd for contest rules and more information. Morey’s Piers is also seeking love stories that incorporate Morey’s Piers or the Wildwoods. From couples who met at Morey’s, were engaged on the piers, married in Wildwood, or have been visiting together for generations, Morey’s wants to hear about it. Stories can be submitted to info@moreyspiers.com with the subject line "Wild Wedding." WildwoodStock ride wristbands will be available for purchase online starting April 1 through May 5 at www.moreyspiers.com/wildwoodstock. Online tickets are priced at $24.95 for guests 48” inches and taller and $19.95 for those under 48” and include a $5 food and beverage credit. Three-day ride wristbands valid from Friday-Sunday are available for purchase both online and onsite. Prices are $39.95 for guests 48” inches and taller; $34.95 for those under 48”. Tickets purchased onsite for Friday/Sunday are $24.95 for visitors 48” and taller and $19.95 for those under 48”. Onsite Saturday passes are $29.95/$24.95 respectively. Mariner’s Pier, located at Schellenger Avenue, hosts WildwoodStock from Friday, May 3 through Sunday May 5. The pier will be open from 6 pm to 10 pm on Friday; 12 pm to 10 pm on Saturday; 12 pm to 5 pm on Sunday. For more information on WildwoodStock visit: www.moreyspiers.com/wildwoodstock . The Wildwood Business Improvement District (WBID) is partnering with What's On Your Food Truck? Events (WOYFT?) to bring 9 new weekend festivals to Byrne Plaza at 3400 Pacific Avenue in Downtown Wildwood in 2019! 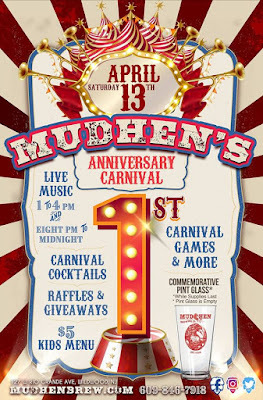 Each these fun-themed events will offer a great variety of entertainment, food, beverages, vendors, games and more fun for the whole family. Nancy Proctor, Managing Partner of WOYFT? events and the organizer of Downtown Wildwood festivals, is looking forward to introducing WOYFT? to Downtown Wildwood and promises fun for everyone, beginning April 13 & 14 with the Downtown Wildwood Wine & Chocolate Lovers Weekend. House of Cupcakes (winner of Cupcake Wars), Five Sisters Catering, Tacoholics, Ribeyes, Cold Stone Creamery, Coffee Boutique, Grilled Cheese Factory and Jersey Roll are just a few of the food trucks that will surround Byrne Plaza for this event, while Laurita Winery, MudHen Brewing, Laura's Fudge, Rocky Mountain Chocolates, 1892 Ecuadorian Chocolates, Cammie's Candies, Bacon Bites, Serenitea, For the Love of Toffee and more tented vendors will be set up inside Byrne Plaza. Lawn games, a bounce house, daily Giant Easter Basket giveaways and the Sunday Easter Egg Hunt will keep the kids entertained. Adults can visit the Cigar Smoking Lounge, featuring John Hay specially blended chocolate cigars. Fire pits and seating areas will be set up, as well as lots of open space for you to sit and enjoy food and beverages al fresco. Up to date details can be found online at www.DOOWW.com and under Events on Facebook at Wildwood By The Sea.